Children do not come music-lesson-ready; Theory Fun 1A provides an attractive approach to developing general knowledge and language for beginning lessons. Each page takes a look-and-see approach to the topic making it easy to use for both students and parents. Students learn about melody, pitch, rhythm, keyboard and staff in through written exercises, word search, mazes, fill in the blanks and matching games. 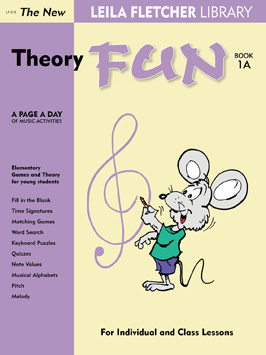 Theory Fun 1A is equally effective for both classroom or private study and was written to compliment any method series.